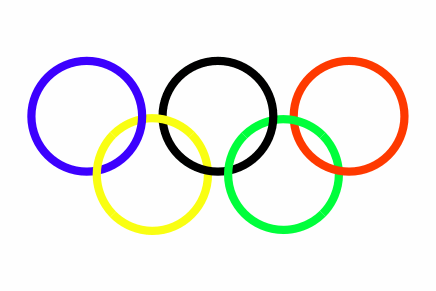 The Olympic Flag, which flies in the main stadium and all other venues of the Games, is white with five interlaced rings in the center. The rings are blue, yellow, black, green and red, with the blue ring high on he left, nearest the flag pole. These rings represent the five continents joined in the Olympic Movement. The proper arrangement and interlacing of the rings is shown on the sketch below. here is no country that has not one or more of these colours in its national flag. It was created in 1913, at the suggestion of Baron de Coubertin, and was used for the first time at the Olympic Games in 1920 at Antwerp. There are official flags for both the Olympic Games and the Olympic Winter Games. 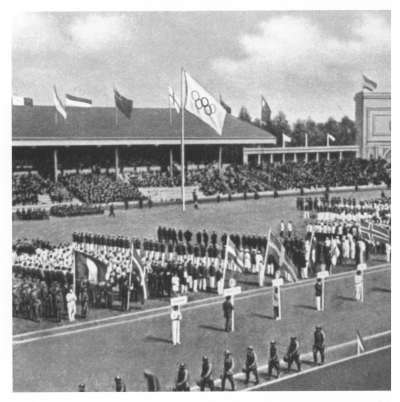 "We swear that we are taking part in the Olympic Games as loyal competitors, observing the rules governing the Games, and anxious to show a spirit of chivalry, for the honor of our countries and for the glory of the sport." Thus modern Games go back, little by little, to their illustrious ancestors by the successive restoration of both the ceremonies and the symbolic acts which gave to the former so great and deep a meaning. The second innovation was the appearance of the Olympic flag, with its five entwined circles, multicolors on a white background, evoking the five parts of the world united by Olympism, and at the same time reproducing the colors of every nation. This flag was inaugurated in Paris, June, 1914, during the celebration of the 20th "anniversary of the reorganisation of the Olympic Games," but it had never yet appeared at an Olympiad gathering. At Antwerp, its glorious colors were displayed everywhere, and its popularity was great, so great that a group of athletes, one fine night, in the town, carried off everything so as to bring home with them this tangible souvenir of the Seventh Olympiad. Unfortunately, the Police were on guard: arrests, trials, consular interventions, followed.